They are part of the confectionery corporation associated with the president. 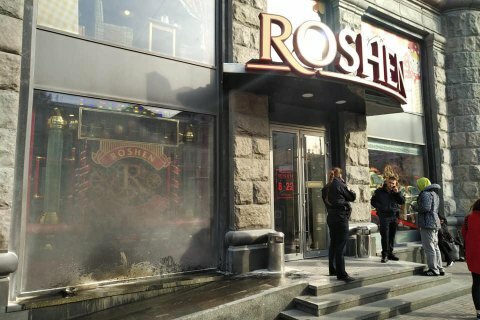 A member of the extremist organization White Balaklavas threw a smoke-puff charge in a Roshen confectionery store in Bessarabska Square in central Kyiv, setting its window decoration on fire. The fire was quickly extinguished by the staff. Last night two unidentified men poured some liquid on the wall of a Roshen store near the Heroyiv Dnipra subwaystation and set it on fire. According to the Security Service of Ukraine, the attack on the Roshen in Bessarabska Square was carried out by a member of the extremist organization White Balaklavas, which was planning to disrupt the elections in Ukraine. He is an "active participant in numerous street rallies happening in Kyiv and is a member of the radical extremist organization whose head was detained by the SBU and is in a remand centre". He is being checked for the arson near the Heroyiv Dnipra station.